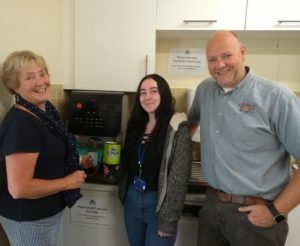 The Coffee Bean Company is delighted to announce that we have donated a brand new coffee machine to the leading Southampton youth charity, No Limits. The charity offers support to children and young people under the age of 26 who live in Southampton and Hampshire. Some services include an Advance Centre in central Southampton. The new coffee machine will enable young people to enjoy a café-style hot drink. This will offer a little extra to the people receiving support from the charity. In addition to the new coffee machine, The Coffee Bean Company has also donated £300, which will allow the No Limits charity to support those who are vulnerable in Southampton. If you are interested in more information on the charity, No Limits, please click here on the link to visit their website.